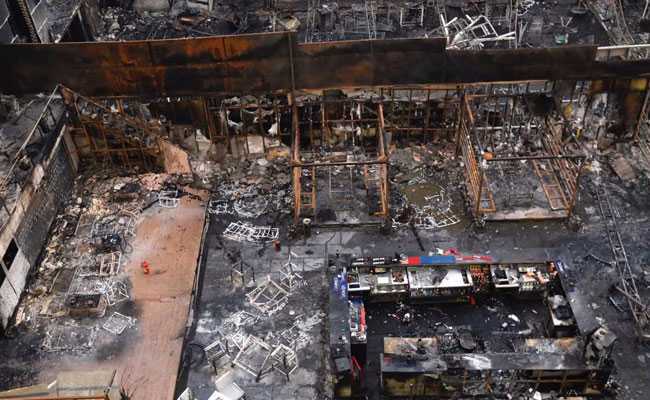 The high court had ordered for the committee to be set up to conduct an inquiry into the Kamala Mills fire. Mumbai: The Maharashtra government today informed the Bombay High Court that retired chief justice of the court AV Savant was appointed as the chairperson of a three-member committee to probe the Kamala Mills Compound fire incident that claimed 14 lives in December last. The high court had ordered for the committee to be set up to conduct an inquiry into the incident. The bench was hearing a Public Interest Litigation (PIL) petition, filed by retired IPS officer Julio Ribeiro, seeking, among other things, a judicial inquiry into the fire tragedy. Senior counsel Vineet Naik, appearing for the government, told a bench of justices SM Kemkar and MS Karnik that the committee was formed. The committee, headed by retired chief justice AV Savant, will also comprise two other members -- Vasant Thakur, an architect on one of the high court panels, and K Nalinakshan, the former chief secretary. The bench ordered the committee to submit its first report on or before August 31. The panel will inquire if there was any violation of norms by the owners of the land or the restaurants, if the immediate and probable cause of fire was owing to violations of the sanctioned plans and approvals granted by various authorities and if there was any dereliction of duty on the part of the civic body and government officials. It will also recommend measures to be taken to avoid repetition of such incidents and other fire safety compliance steps. The bench said the Brihanmumbai Municipal Corporation (BMC) should provide an office, staff and other infrastructure to the committee's chairperson and members. "The remuneration of the chairperson shall be on par with the salary of a sitting chief justice of a high court," the bench ordered. The court posted the petition for further hearing on September 17. On the night of December 29 last year, a fire had broken out at the Mojo's Bistro restaurant in the Kamala Mills Compound at Lower Parel. The blaze had subsequently spread to the adjoining restaurant, "1 Above". Fourteen people were killed in the incident and several others injured. An inquiry by the Mumbai civic body had revealed large-scale construction irregularities and violation of safety norms at the site of the tragedy.